Quarter To Twelve, Part 2! Joe continued his discussion of Little Walter's classic, Quarter To Twelve this week. This slow blues has a jazzy feel and is punctuated by bursts of notes. Because it is played acoustically, Walter uses various hand techniques to modify his tone -- Joe has notated these on the transcription. Remember that guitar or bass accompaniment should be playing the Blue Midnight riff (and sequencing it over the chord changes), which you'll find on the first Blue Midnight transcription. Learn to play this line on your harmonica or at least be able to hum it, so you can get the band to play correctly behind you. View transcription. RECITAL SIGN-UP SHEETS DUE NEXT WEEK! Joe passed out Recital Sign-up Sheets last night and they are due back next week. 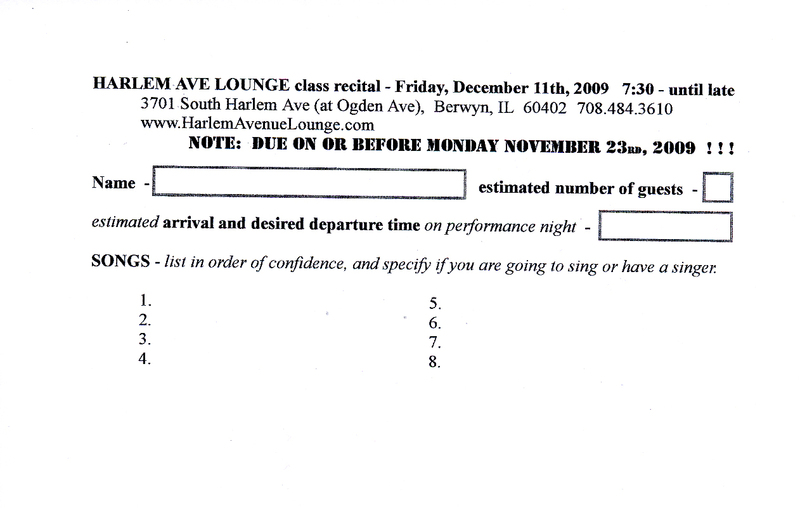 Put together your song list for the December 11 recital and turn it in so Joe can create a schedule. If you can't make the recital, it's important to let Joe know that. If you are going to miss class next week, please send your sign up sheet with a friend or email us at info@youmissedmonday.com. Remember, Joe highly recommends that you do your talking blues song at the recital. Here is an interesting site that shows a visual depiction of note bending. Please note that Joe cautions against exerting excess pressure or using force to bend notes. Get your tickets now for the next Harmonica Convergence show featuring Joe Filisko, Howard Levy, Corky Siegel and Peter Madcat Ruth at the Old Town School, March 21, 2010. The show will be a tribute to the great harmonica legend, and longtime Steve Miller Band member, Norton Buffalo.